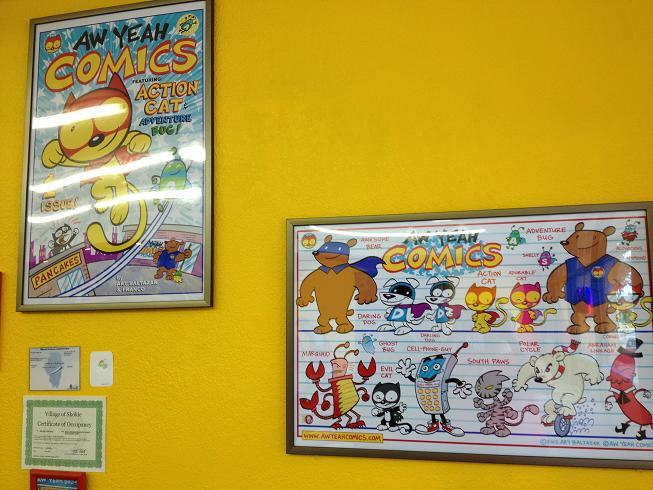 Aw Yeah Comic is owned by Franco Aureliani, Art Baltazar, and Marc Hammond. 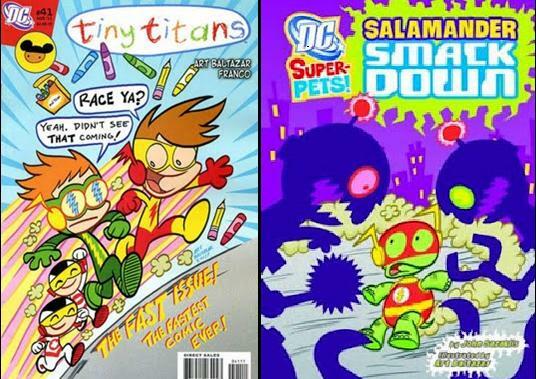 You may remember Art and Franco from Tiny Titans. 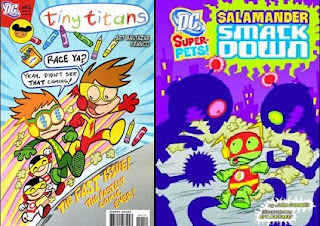 Art also does the art on DC Super-Pets line, including the book Salamander Smackdown. In my mind that qualifies them as Flash artists. Marc Hammond is not a Flash artist. 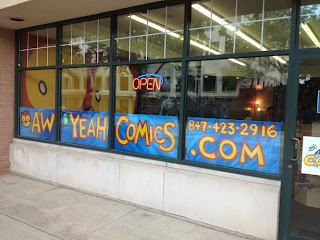 He did help run my local comic shop for years though. So when he moved up to Skokie to run his own shop I was very happy for him. Happy for him, but I totally miss talking with him over coffee and donuts and the shop. Consider yourself lucky Skokie. The actual shop is wonderful. Even from the outside you can see how bright and friendly it is. When you go inside there are large open spaces. There are four chairs that you can sit down and read your books and hang out for a bit. 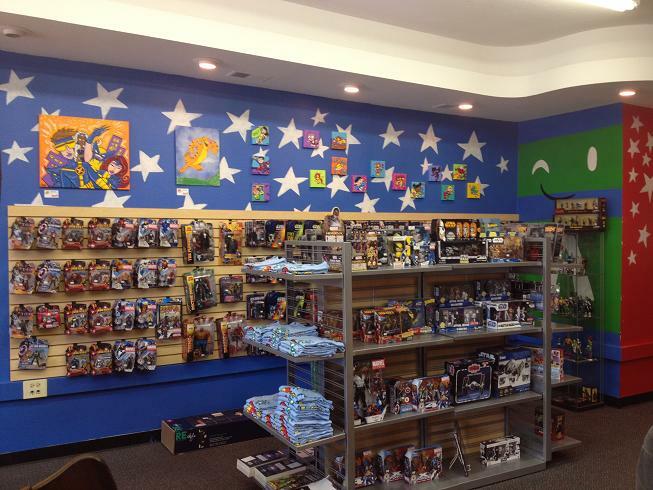 This isn’t one of those stores that have piles and piles of things stacked to the ceiling. You don’t have to worry about being crushed under a copies of old books and never having your remains found. It also isn’t one of those stores that you have to be worried about bringing your kids into. 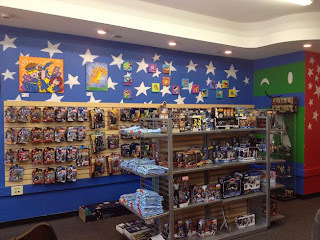 Just like Art and Franco’s comics, the store is very kid friendly. 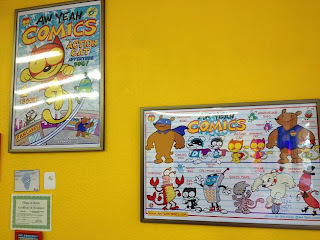 I suppose the big news about the shop is that Art and Franco will be publishing an independent comic about the stores mascots. It won’t just be Art and Franco either. They have a number of other creators already lined up to help tell the stories of Action Cat and Adventure Bug. The comics aren’t ready yet but Aw Yeah already has T-Shirts, buttons, and patches. The comic is going to be huge, I can’t wait. If you’re up in Chicago do yourself a favor and make a side trip to Skokie. Also...Skokie is kinda fun to say. Skokie Skokie Skokie.